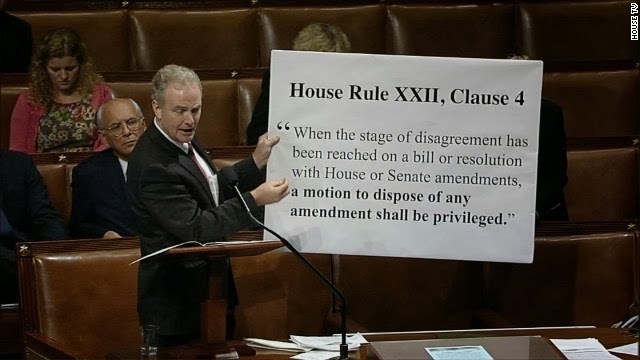 Rep. Chris Van Hollen (D-Maryland's 8th District) exposes the latest rule change by the House Republicans. If you've ever served on any type of student leadership organization or a board of directors then chances are you have run across parliamentarian procedure (aka "Robert's Rules of Order"). The purpose of these rules is to allow the members of any organization to conduct business in an orderly fashion as opposed to getting sidetracked on tangents, gossip and other irrelevant nonsense. However, in the United States Congress, it does not appear that all of the rules were designed for this purpose. Indeed, the latest rule change adopted by the House Republicans on the eve of the government shutdown has a much more sinister motive. In case you don't speak Parliamentary Procedure, let me explain what you're about to see in the video below. Basically, the House Democrat that you will see in the video (Rep. VanHollen) is trying to introduce a bill onto the House floor that was previously passed in the Senate. That Senate bill was a "clean" (meaning it only does one thing) Continuing Resolution ("CR") that would have simply re-opened the government if the House had voted to approve it. However, before the House can vote on anything it must first be introduced onto the House floor. Hence, Rep. VanHollen tried to introduce the bill onto the House floor. However, he is told by the acting House Speaker Pro Tempore, Rep. Jason Chaffetz (R-Utah's 3rd District), that he is not allowed to do so. Rep. VanHollen is then seen in the video asking a bunch of clarifying questions to Rep. Chaffetz as to why he (Rep. VanHollen) is not allowed to introduce the bill onto the floor. At the end of the video, Chaffetz eventually admits that the reason why Rep. VanHollen cannot introduce the clean CR is because the Republicans introduced an amendment to the House Rules on the night before the government shutdown. That amendment to the rules is known as "House Resolution 368." What House Resolution 368 says is that only a member of the House majority -- that would be the Republican party -- is allowed to introduce "any motion" onto the House floor if that motion is related to this government shutdown. This was unheard of prior to September 30, 2013. Under the previous House Rules (cited by VanHollen in the video as Rule XXII Clause 4) any member of the House of Representatives -- either Democrat or Republican -- would have been able to do what Rep. VanHollen was trying to do. But now, thanks to this new House Rule, only the Republicans can. I'm sorry, did I say that the purpose of parliamentary rules was to allow an organization to conduct business in an orderly fashion? What I meant to say was that the purpose is to ensure total oppression of anybody who disagrees with you. My mistake.